Gestation is the period of time between conception and birth. During this time, the baby grows and develops inside the mother's womb. If the baby's gestational age findings after birth match the calendar age, the baby is said to be appropriate for gestational age (AGA). AGA babies have lower rates of problems and death than babies that are small or large for their gestational age. 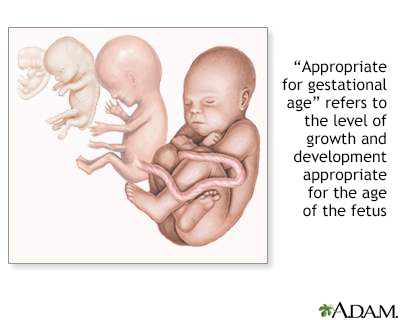 Gestational age is the common term used during pregnancy to describe how far along the pregnancy is. It is measured in weeks, from the first day of the woman's last menstrual cycle to the current date. A normal pregnancy can range from 38 to 42 weeks. Gestational age can be determined before or after birth. Before birth, your health care provider will use ultrasound to measure the size of the baby's head, abdomen, and thigh bone. This provides a view on how well the baby is growing in the womb. After birth, gestational age can be measured by looking at the baby. Weight, length, head circumference, vital signs, reflexes, muscle tone, posture, and the status of the skin and hair are assessed. The wait for full-term infants that are born AGA will most often be between 2,500 grams (about 5.5 lbs or 2.5 kg) and 4,000 grams (about 8.75 lbs or 4 kg). Ball JW, Dains JE, Flynn JA, Solomon BS, Stewart RW. Growth and measurement. In: Ball JW, Dains JE, Flynn JA, Solomon BS, Stewart RW, eds. Seidel's Guide to Physical Examination. 8th ed. St Louis, MO: Elsevier Mosby; 2015:chap 6.